I have always told people that these products are apples and oranges. If you want a side by side functionality comparison, you will be led astray. I don’t advice companies to make their product selection based on how PeopleSoft Payroll calculates gross to net vs. how Cloud Payroll calculates gross to net. The matter of fact is that I have seen plenty of pretty good, and pretty terrible PeopleSoft operations, and I am seeing both in Cloud now. That being said, it is a fair request to a consultant who claims to know both product very well, to provide some general ideas to customers on commonalities and uniqueness of both products. This paper is my attempt to provide the information. A few years ago, I had a conversation with a colleague about SaaS – Software as a Service, now almost synonymous with the term “Cloud” (although there are differences). The person said to me, “there is nothing new to it. In my days we call it the hosted solution.” Although overly simplified, I don’t think he was entirely wrong about that. Cloud is essentially a giant “hosting” data center, where the software resides. (1) You don’t need to worry about the Hardware and Software planning activity in the Cloud. Back in my PeopleSoft technical lead days, this was a big project planning activity. You get into all the fun discussions about what is the best choice of database management system (DBMS), web server, application server, file server, batch server, scheduler, OS, etc. You would work yourself to a frenzy trying to define the optimal solution of a balanced economy and scalability architect. You would spend hours trying to convince a committee of people who has not a single clue about DBMS sizing, on why you need certain amount of Gigabyte of space. The discussion was fun, but you would have already exhausted bunch of budgeted time and dollars on the discussion, before any tangible hardware/software is even installed. You do not need to do this exercise in the Cloud. You still need to (and better you do) know your current employees’ population size, growth target, and some basic facts (such as if you are operating globally, in what countries). You provide them to Oracle Cloud sales and planning folks, they will guide you to the best fit subscription plan for the Cloud. Granted that you still need to have peripheral hardware and software, such as, you will need to have a secure network server where you can save the Cloud HCM and Payroll auditing reports, you will need to have Microsoft Excel to work with Cloud Desktop Integrator, etc., but you really can save a bunch on the hardware installation and maintenance/depreciation cost, along with labor costs on DBAs and system administrators. (2) Your software version will always be Up to Date in the Cloud. Many PeopleSoft customers move to the Cloud because they are so behind on their upgrades, that they could no longer catch up. PeopleSoft current release is HCM 9.2 and PeopleTools 8.52. We have helped customers who were on PeopleSoft HCM 9.0 to the cloud, and we are seeing that some customers who are still on PeopleSoft HCM 8.x and wanting to move to the Cloud. In PeopleSoft the software upgrade is a heavy duty exercise. It is not uncommon that consulting company would sell upgrade project as “upgrade/re-implementation”. This is because, in most cases, if you are lag a version or two versions behind, your older customization build on the older tools would not be “upgrade-able” any more, you really better off to re-build them. Your hardware and software that were adequate for your older versions of the PeopleSoft, will no longer be adequate for the newer release. The upgrade would also require extensive regression testing. After the waves of downsizing in the past decade, companies may only have a handful of business people who run daily operations. They cannot spare the time for the upgrade test. Then you would have to hire temps to back-fill for the core team, etc., etc. In all, upgrade is a very costly proposition that could also take a toe on your team’s spirit. In Cloud the software is constantly “upgraded”, and you don’t have a choice to be lag behind. Oracle provides 2 times a year a new release, similar with the Workday. When I started in Cloud business, we were implementing Cloud R7; now everyone is upgrading to R12, with R13 is just around the corner. In addition, Oracle Cloud also provide monthly/quarterly patches for bug fixes (we hope as software getting mature, the patch will be less frequent). For a business, this is good news, as you will always get the most current and exiting features. Comparing to the PeopleSoft upgrade I’d been through, Cloud upgrade process is much smoother and less painful, from the hardware and operating system perspective. However, you still need to have a plan, you still need to test, and you still need to train your people to get use to the new looks and feelings of the software. Ever since I started in Cloud practice 3 years ago, the Cloud Payroll Quick Pay page has already changed 2 times. And we know that it will be changed again in R13. This could be painful to your workforce, if they are more traditional, and more used to the “clicking path” training approach, i.e., they require a book of screenshots that tells them to click here first and there second. Personally, I think this is a “business change management” phenomenon that is not limited in the Cloud upgrade. We all use new technologies daily now – even my 80 years old relatives in China can play some pretty cool games on an iPad or an iPhone. The smart devise OS and game apps change from time to time, but no one seems to have a problem adapting or managing the change. Somehow when the “app” is work related and changed, people just freeze and don’t know what to do. (3) Lastly, and this is a benefit for customers who are using Cloud Payroll only, you will get the more frequent tax update. Tax update in PeopleSoft is on quarterly basis (if my recollection is correct). And just like the upgrade, you have to have a “production” to get it done, from down loading, applying the update, to testing. In the Cloud the Vertex Update is applied to your environments on monthly basis. All you need to do is to run a processing job afterwards to complete the update (this job can also be scheduled to run automatically the day after the Vertex update). 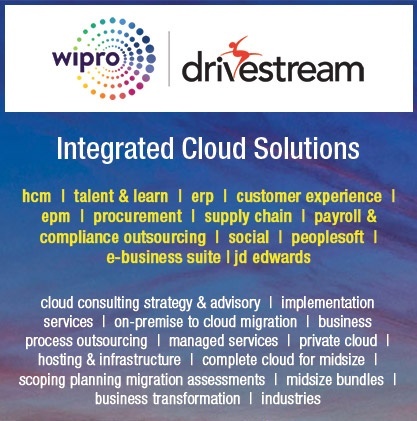 Both PeopleSoft and HCM Cloud Payroll are great payroll solutions. They both provide very powerful payroll calculation engine and configuration frame work. They both handle large amount of local country regulations. That being said, they work completely in different ways. Put them side-by-side is like comparing apple and orange, the result will be a lot of misleading information. What I provide below are high level descriptions on how each system work differently; they are my personal observations and point of views. PeopleSoft payroll has North American and Global modules. They are two separate products. Since most of the US customers are on PeopleSoft payroll for North American, I will only discuss this module. NA Payroll, as we call it, has classic relationship data model. Each set of online pages is for configuration of a business object, such as earnings, deductions, and taxes. Each business object has a set of database tables to match. For example, Earnings Codes are configuring in one set of online pages. Each business definition has one main database table to match. Each main database table could have one or more child table. The earnings code main table is PS_EARNINGS_TBL. If an earning code needs to be subject to a taxation, such as FIT, SIT, etc., you will tell the system to do so by configuration on the Earnings Table – Tax page. You may name an earning code Regular but have no tax attached. This presents a challenge that when you build the configuration, you really have to think through and not forgetting anything. Because if you did not tell the system to take FICA tax on an earning code, it won’t be taken. On the other hand, to us long time PeopleSoft practitioners, this is a linear and concise way of connecting page, object, and database tables together. The Cloud Payroll had only one module, called Global Payroll. But, as we all know, there really isn’t a Global Payroll, per se. Payroll by nature is all local – because taxation, earning/deduction qualification and currencies are all based on local payroll regulations and rules. The localization of the Cloud Payroll rules, for example, for US, is identified by selecting payroll feature for the country, configuration of the US Legislative Data Group, and load US specific address hierarchy. These invoke the system built-in, country specific regulation rules to be “released” in the system. The Cloud Payroll data structure and hierarchy are more of “object oriented”. The earnings, deductions and taxes configuration are all hosted in one common set of pages, called Element. Each element belongs to a Primary and Secondary classifications that already have local regulatory rules attached. You start the configuration by choosing a Primary and Secondary class. Once you did that, your element’s relationship to the taxation is already defined. The system then gives you a list of rules and choices for you to define other related behavior of the element. Each element will have input value or values to accepting data input, associated elements for calculation processing (which are attached with Fast Formulas), results storage, etc. There are many database tables associated with elements. The naming convention of the tables may not necessarily suggest that particular table has anything to do with the element. For a longtime PeopleSoft practitioner, at least for me, there is definitely a steep learning curve to get use to the Cloud Payroll. We are more used to tell the system what to do, and less inclined to work with a pre-defined framework. However, once getting through the learning curve, I grew to appreciate the Cloud Payroll system, and the dynamic aspect of it. From configuration stand point, it definitely provides a more scale-able alternative for handling multiple sets of regulations within a single instance, a.k.a, the Global Payroll. PeopleSoft Global Payroll module has similar “element” structure. It is a closer cousin of the Oracle Cloud Payroll than to PeopleSoft NA Payroll. Again, PeopleSoft NA payroll presents a liner, 3 step process – Sheet, Calc and Confirm. These are built with COBOL dinosaur programs that some of the millennials never heard of. The sheet, paysheet creation, is to check PeopleSoft Job data and populate a paysheet line by line, much like a spreadsheet. The Calc, payroll calculation, is to validate and update those lines with earnings, deductions, and taxes. Confirm, pay confirm, is to issue the payment. Confirm also marks the closure of a payroll run. The biggest challenge for me in my PeopleSoft days, was getting stuck on the Calc or Confirm steps with errors. Because the structure is liner model, when the relationship is not defined or is not clear, or in some cases because IT people went through the back door and did something to it, the system will give errors. For example, if an employee has a shift defined on the job by an effective date, but when the Calc step is validating against shift table to get Shift Differentials, it could not find the matching ShiftID with the correlation of the effective date, it gives an error. PeopleSoft system does not have “roll back” functionality that is in Cloud Payroll, which I came to appreciate. It takes the approach of processing everyone unless it is told not to. This demands time needed for error correction and reprocessing. Since payroll is a deadline driving operation – when you got pay you got pay – when you run out of the time to figure out errors, you need to check “not OK to Pay” flag on the pay lines and move on with the rest of the payable employees. And you will later calculate the errors in an “off-cycle”. Cloud Payroll processing has several steps – retro calculation, payroll calculation, prepayment, archive, and generate payments. Each step can run for a group, individual or entire payroll. It can be repeated, for example, if you missed few people’s timesheet input, you can run them separately in a group. It has the principal of processing what’s ready to be process and not already processed, i.e., if employee has calculation error, the prepayment will not process them. On the other hand, the later step will only process the “new output” from the earlier step, so there is no chance for double paying. The earnings and deductions are input to element entries – most of the elements are built with very earlier effective date, such as 1/1/1951, therefore avoided the effective date mis-matching or code mis-matching errors. Cloud payroll does give errors. For example, when tax card (tax form as they are called in PeopleSoft) is not complete for new hires. Or when costing allocation is over 100%. Once error corrected, you can decide if you want to re-try for the errored employees only, or rollback and rerun for entire payroll. Again there is a learning curve for PeopleSoft practitioners. We are used to the steps that are more tightly controlled by the system and not have to think about where we are, or what to do next in order to achieve the desired outcome quickly. The Cloud Payroll provides a more dynamic way of processing. One has to wear the thinking cap throughout the processing. System performance wise, Cloud Payroll is a winner for me. You can define the “parallel” processing by a simple configuration, without having to get into database table partition and all that technical tasks. PeopleSoft rolls its reputation on allowing customization. Since you have the control of the database, you can load the data to a database table whichever way you wanted. You can build SQR programs, Java programs, or simply using SQL. There are some prebuild loaders for loading data from PeopleSoft Time and Labor to PeopleSoft Payroll. But largely, customers are on their own device for getting the data in. For output, again, most customers have many IT folks to build sophisticated reports using programming language. There are pre-build reports. In my days we customize the heck out of them; maybe less so these days. PeopleSoft also has PSQuery tool for savvy business users to build their own queries. They would memorize some of the table and fields names and get training on how to work the “join”. In Cloud Payroll you work with cloud templates and tools. There are predefined loaders and loading templates for loading the input data into elements, or tax cards, etc. You must follow the templates diligently, or your data will be rejected by the system. There are “technical” templates such as HCM Data Loader (HDL), that require sophisticated data mapping. You would want technical folks to handle them. There are also templates for savvy business users, such as Payroll Batch Loader (PBL), or Spreadsheet Data Loader (SDL) -- they can use Oracle Excel Application Desktop Integrator to get the pre-defined templates and upload data to the Cloud themselves. Again this method may take some time getting used to, especially for business users who have had strong technical support in their PeopleSoft environments. But all of the payroll managers who we taught how to use the PBL are managing the data loading very well. Cloud has a set of payroll auditing reports and regulatory reports. They are not meant to be “customized”. Most of these reports are delivered in PDF default format. They have Excel outputs as well – users can down load them and perform next level reporting needs in the spreadsheet. Cloud PSQuery equivalent tool is OTBI. Oracle provide OTBI Subject Area, where a related set of business objects are pre-joined, and users can drag and drop to compile their own reports. Technical team members who mastered Cloud Payroll table structures can also build BI reports for business users. In summary, the fundamental structure, technology, tools and processing methods are completely different in PeopleSoft Payroll for North America and Cloud Payroll. PeopleSoft is a mature, tried and true product. Cloud Payroll is still a young, but very powerful product. Do I miss PeopleSoft? Not really. I do miss my technical power, where I can SQL to fix about anything when everything else fails. But I also know that is not sustainable solution for business in long term. I can certainly see many aspects of Cloud Payroll that still need improvement; in the past 3 years I have seen many improvements indeed. My Leadership Mantra - do as you ask others do, and never ask others do what you cannot do. My Chinese Philosophy - I hear I forgot, i see I remember, I do and I understand. My Western Believe - To escape boredom, man works either beyond what his usual needs require, or else he invents play, that is, work that is designed to quiet no need other than that for working in general.